One of the stunning burial items found in the king’s coffin is the Collar of Nekhebet, a flexible piece that lay across the king’s chest. Made of 256 small gold plaques threaded together and inlaid with colored glass, the collar forms an image of the white vulture Nekhebet, the patron goddess of Pharaoh. In her talons the vulture clutches two orbs that symbolize the eternal protection thought to be in her power. The Collar of Nekhebet and other of the king’s treasures recall a time when Egyptian jewelry played an important role in Israel’s history. Jacob (Israel) and his family had moved to Egypt because of a famine in Canaan. There the Israelite population grew large, and Pharaoh eventually forced them into slavery. God had compassion on the slaves and delivered them under the leadership of Moses. In preparation for leaving Egypt, the Israelites “asked from the Egyptians articles of silver, articles of gold, and clothing” (Exodus 12:35). 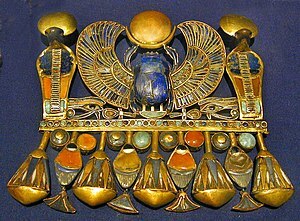 Note that the jewelry taken from King Tutankhamun’s tomb is dated roughly within 100-150 years of the time of the Exodus. So it’s probable that the riches Israel carried out, while not royal treasures, reflected the artistry of the tomb pieces. God required an offering from the people. Under His inspiration, they built a tabernacle for the LORD from the clothing, jewelry, silver, and gold that once belonged to Egypt (Exodus 36-40). The tabernacle represented God’s presence with His people, and the end of Egypt’s power to enslave them. In an account pre-dating the Exodus, Rebekah accepted two gold bracelets and a nose ring from the servant of Abraham. In attaching the nose ring and slipping the bracelets on her wrists, the servant claimed Rebekah for his master’s son, Isaac. This formality of giving and receiving jewelry was the first step in a marriage negotiation. Similar to wearing an engagement ring, Rebekah’s wearing of the nose ring and bracelets indicated her willingness to discuss terms of marriage (Genesis 24). Through the prophet Ezekiel, God expressed His love in terms of giving jewels to His bride, Jerusalem. “. . . I clothed you with fine linen and covered you with silk. I adorned you with ornaments, put bracelets on your wrists, and a chain on your neck. And I put a jewel in your nose, earrings in your ears, and a beautiful crown on your head. Thus you were adorned with gold and silver, and your clothing was of fine linen, silk and embroidered cloth . . . you were exceedingly beautiful” (16:10-13). If negotiations had broken down between Rebekah’s parents and the servant representing Isaac’s interests, I believe Rebekah would have returned the nose ring and bracelets. They were given and received as a prelude to marriage with the hope that Isaac and Rebekah would build an enduring relationship with one another, which they did. Isaac had no other wives, and the marriage between Isaac and Rebekah was characterized by affection. That’s not how it turned out for God and ancient Israel, however. Ezekiel tells of God’s incredulity: Jerusalem (Israel) gladly received His gifts of material wealth and health, but failed to love Him. Shamelessly she used the presents to go after others. King Saul customarily wore a broad gold bracelet on his upper arm and a crown to signify his royalty. When an Amalekite killed Saul and took his crown and bracelet to show David, he made a fatal error in thinking David would be pleased with proofs of Saul’s death (2 Samuel 1:10-16). A silver coin dowry necklace or headdress was “one of the most prized pieces of jewelry worn by a bride.” A woman’s dowry and jewelry belonged to her and formed a kind of insurance policy when her husband died, or if the marriage failed. It is suggested that the lost coin in Jesus’ parable may have been part of a dowry necklace or headdress, although Jesus did not specify the coin constituted part of the woman’s dowry. The prideful wearing of jewelry usually brings undesirable consequences. Isaiah wrote of God’s displeasure with the arrogant women who made an ostentatious display of themselves. “. . . Because the daughters of Zion are haughty, and walk with outstretched necks and wanton eyes, walking and mincing as they go, making a jingling with their feet; therefore the Lord will strike . . . in that day the Lord will take away the finery, the jingling anklets, the scarves, and the crescents, the pendants, the bracelets, and the veils; the headdresses, the leg ornaments and the headbands; the perfume boxes, the charms, and the rings; the nose jewels, the festal apparel, and the mantles; the outer garments, the purses, and the mirrors; the fine linen, the turbans, and the robes” (Isaiah 3:16-23). It may have been in response to the heavily adorned female attendants at the Temple of Diana, that Paul and Peter advised Christian women to be moderate in their wearing jewelry and in their dress. Peter stated that a woman has both an outer and an inner adornment to consider in light of God’s preference. “Do not let your adornment be merely outward—arranging the hair, wearing gold, or putting on fine apparel—rather let it be the hidden person of the heart, with the incorruptible beauty of a gentle and quiet spirit, which is very precious in the sight of God” (1 Peter 3:3-4; see also 1 Timothy 2:9). Posted in Bracelet, Collar of Nekhebet, dowry, Egypt, Jewelry, King Tut, Nose jewels, Pharaoh of the exodus, Pride, Rebekah, The exodus, Uncategorized. Bookmark the permalink. After reading a couple (non mainstream) historians ( Velikovsky’s “Ages in Chaos” and David Rolle’s “Pharoahs and Kings” ) I suspect that King Tut was more around the time of King David. Saul was probably mentioned in the Amarna letters to Tut’s father Akhenaten. It’s doubtful anyone is ever going to get Egyptian chronology straight though. Also it’s interesting that in OT times it was proper for a woman to dress ostentatiously — yet Paul forbids it – at least for church services. This sounds like asceticism but it wasn’t — if you will read Bruce Winters’ “Roman Wives Roman Widows” it becomes clear that dress for a married woman that would have been considered respectable in OT times( we see God dressing Israel this way) was not just unrespectable but illegal or semi-legal in the Roman period that Paul preached in. The fancy dress described in the NT was avoided by Christian women to avoid the appearance of evil. Women who dressed in pearls, gold, expensive (sometimes transparent) fabric in public were imitating the high class prostitutes — not just imitating in the modern sense but actually taking on the identity of the prostitute. This was a common trend at that time — the authorities whose job it was to control the dress of women could not always enforce the rules. But Paul came down on the side of the law (even though he knew these items of dress were not inherently evil ) for the sake of avoiding the appearance of evil, so that the church could preach the gospel effectively without appearing to be hypocritical — and for the protection of the church which was ever in danger from the authorities who kept a close eye on “cults” – especially those that seemed to have political leanings ( think “kingdom of God” ) or whose women were involved in licentious activities. I read in one reference that the roman officials had trouble enforcing their rules of dress. The reference indicated it was kind of a losing battle even for the Romans to temper what their women wore!